In 1973, Steve McQueen and Dustin Hoffman starred in the prison escape drama Papillon. 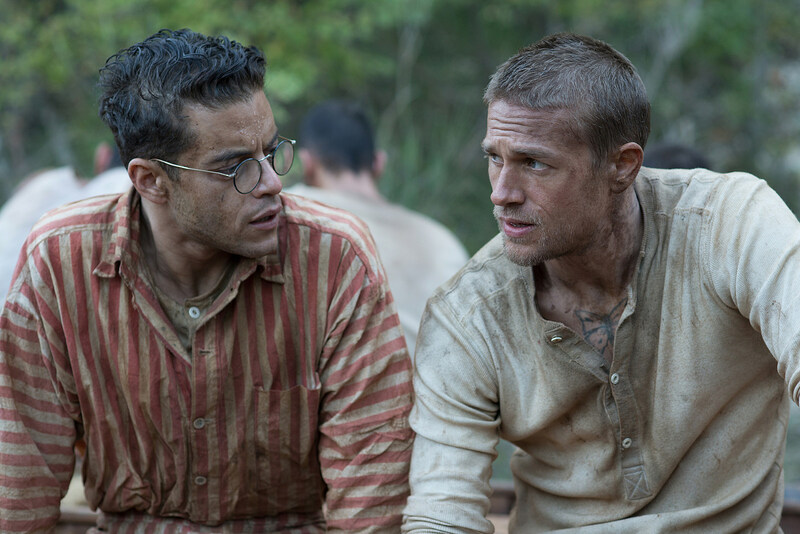 Now their roles are being played by Charlie Hunnam and Rami Malek in a new remake from director Michael Noer. Those may be big shoes to fill, but for the Mr. Robot star, getting over the intimidation factor is just a part of the process. Noer’s Papillon is based on two memoirs by French safecracker Henri Charrière, nicknamed “Papillon,” the French word for “butterfly,” for the winged tattoo on his chest. Set in 1931, the film follows Hunnam’s Papillon after he’s wrongly convicted of murder and sent away to the brutal prison colony of Devil’s Island in French Guiana. There a warden wastes no time setting the devastatingly harsh ground rules: if you try to escape and fail, you’re thrown into solitary for two years; the second attempt gets you five years; and if you kill a guard? The guillotine. That doesn’t dissuade Papi, who strikes up a friendship with Malek’s Louis Dega, a mega-rich counterfeiter who discreetly hides rolls of cash up his… you get the idea. Louis gives Papi money to aid his escape, while Papi protects his new friend from the fists and knives of other inmates. Last week I caught up with Malek over the phone to talk about his new movie, and why he chose to take on a remake of an iconic film. 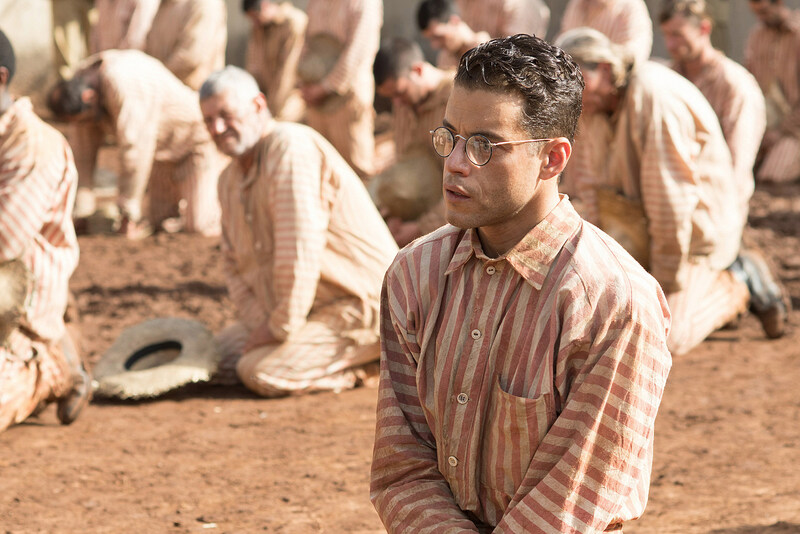 He told me about growing up watching the original Papillon with his dad, getting to paint across a prison cell like a five-year-old, and the experience of playing Freddie Mercury and recreating the legendary Live AID Queen concert for the upcoming Bohemian Rhapsody. I imagine it must be somewhat intimidating to step into a role previously played by Dustin Hoffman. Well, that’s what everybody asks. So yes, it was a bit intimidating, but you gotta get over that if you’re going to have any life in this career. Had you seen the original film before signing on for this? Yeah. It’s an iconic film and one I watched with my dad when I was younger. I really appreciate it. It’s the reason this — besides being an exceptional book and memoir — is a really unique film. Obviously one would ask, why remake it? I had an exceptional, unique director named Michael Noer, who has a particular style and vision that I thought would lend this a fresh, sophisticated, and somewhat philosophical love story for an escape movie. Do you need a director to be able to bring that kind of fresh perspective to a project, especially something that’s a remake, to get you excited about it? Yeah. It’s a director’s medium that we work through. So if it wasn’t the right guy for the job, you’d definitely think a few more times about entering into this territory. But it’s also a really visceral and emotional story. I think bringing an artistically modern, a more contemporary adaptation [to the story], was something that could be beneficial. Had you revisited the original Papillon again before shooting this, or did you keep a distance from it to make the character your own interpretation? As actors I think we, through osmosis we soak things up. Even if I just wanted to see the movie, I think I would absorb some of his performance, and that is already difficult enough to steer clear of. You know what I mean? Did you do much research into the real Louis Dega? There’s been a lot of debate over the authenticity of the real Papillon’s memoir, so I’m curious what you learned about the real Dega. You know, we all read — Michael and Charlie and I –—this book called The Dry Guillotine by René Belbenoît. There are characters in that that I think we took things from. We took the drawings. There were incredible artists in that prison, as you’d find all walks of life in any prison. So in order to tell the story of these men, you want to tell the story of many men, and that’s what the end of the film speaks to. What the film in its entirety speaks to is these guys could’ve been anybody. So as much as I learned from Dega, I was just drawn into all of the stories of these men and just how universal that experience of incarceration was. But character-wise, did I learn anything from [the real Dega]? I don’t know, I think it’s all there in the film. Whatever I learned, I put out there. You mentioned the drawings, which is a big part of your character’s story. At the end we get to see him painting these huge sketches all over the prison. Did you have someone to create those for you, or were any of the sketches your own? I had an incredible Serbian artist, I can’t remember his name, but he is terrific. I just tried to emulate as much as I could on the day. It was quite fun doing that, in between takes. I enjoyed that, I enjoy seeing my own handwriting in the projects I work on. There’s only so much of that you can do from an artistic drawing or painting perspective. It was a really enjoyable experience. I mean, you don’t get to paint on a wall like that unless you’re five years old [laughs]. And you better prepare to get in trouble for it. That must have been pretty fun to have free rein to paint all over the place. There’s a lot of heavy moments in the film, but Louis and Papillon develop a very sensitive relationship that helps carry them through. What was it like to develop that with Charlie? There’s no way that this film works if you don’t have that evolution of their friendship and their bond. You never know how that’s going to go with another actor and fortunately I got stuck with Charlie. He’s just a dedicated craftsman and a hell of a guy to be around. I have such respect for him. He’s definitely someone who will be with me for quite a long time in friendship. That was partially because you know you’re going in the trenches, so to speak, with someone [and] you instantly seek that kind of brotherhood going into situations like this. When it turns out that it’s authentic and it wasn’t manufactured, it’s a really special thing. You’ve also got Bohemian Rhapsody coming up. That trailer, you look so much like Freddie Mercury it’s just wild! Yeah, man. I don’t know what to say, it was the opportunity of a lifetime. As daunting as it would be to try to think about ever filling his shoes — which is impossible, there’s only one Freddie Mercury — it was still something that I could not pass up. And I just hope people appreciate it and have a little bit of a window into his life. The trailer teases so many iconic Queen songs, but was there a particular song or performance you enjoyed shooting most? Everyone knows I think at this point that the Live Aid concert is in the film. That sequence stands out as one of the greatest in rock and roll history, so you can’t argue with getting to be there on that stage and get the tiniest glimpse of what that performance could’ve been like for those guys. I imagine that must have been incredible to recreate. Yeah, it’s unlike anything you could imagine. It’s a one-off experience. I cannot even begin to put it into words. He’s a fascinating, beautiful human being and getting the chance to just bring everyone a little bit closer to him, it’s a true gift. Before you go, I want to ask about Mr. Robot. Christian Slater just said the next season will be the last. Do you know anything about that, or when the show will wrap up? That’s news to me. Christian, I should text him. It’s his birthday today. I’ll give him a ring and find out what info he’s got. Well, if Sam [Esmail, series creator] can do the rest of the story in one season, that’ll be a feat.